Music for Maniacs: The Note-Ables: Worst Lounge Band Ever? The Note-Ables: Worst Lounge Band Ever? Back up by request: "Halloween Stomp." The recent post re: Banda Plástica De Tepetlixpa Mex. 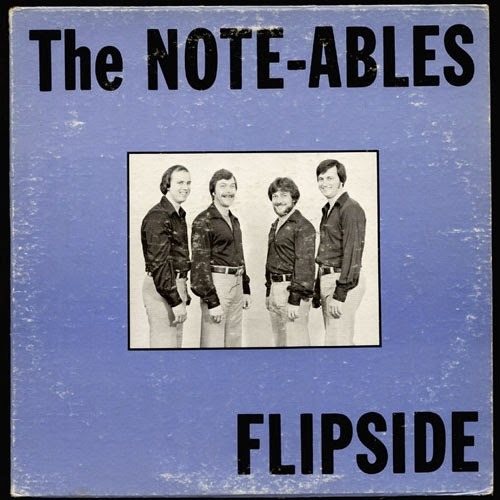 reminded me of another wonderful exercise in musical incompetence, the most hapless lounge band I've ever heard..ladies and gentlemen, please welcome...The Note-Ables! Maybe they should have been called the Note-Unables: sporting off-beat (in the original sense) drumming, mangled lyrics, goofy vocals, the occasional sick trumpet, and guitars so out-of-tune they're practically "No Wave," one has to wonder if these guys were deaf. I originally featured one song, their remarkable demolition of Chuck Berry's "Roll Over Beethoven" on my collection of private-press lounge wonders "I'll Take Las Vegas," and tho it's still the, uh, "highlight" of this album, there's plenty more goodies here: Neil Sedaka/Elton John's "Bad Blood," Glen Campbell's "Rhinestone Cowboy," and lots of Beatles. They have no feel for rock'n'roll, so naturally, there's plenty of it. Only the last couple songs, standards where horn and accordion take over, do they sound like they're in comfortable (tho no less incompetent) territory. But you gotta love these guys - they sound like they're having a great time. Everyone's drunk and having a party, and the accordion is the coolest, most rock 'n' roll instrument in their world. Out-of-control naive exuberant joy is infinitely superior to such dull standards as technical skill and recording quality, right? Tracks 4, 9, and 11 are originals. Sadly, no biographical info out there. Have no idea where they're from. Don't remember where I got this, but this isn't my copy - I believe the late, great Bellybongo site first posted it. So thanks to whoever! Worst lounge band ever? I don't think so - I've personally heard a much worse one (in the worst pub in Scotland, incidentally - which, if you're ever in Edinburgh, is the Canny Man's; check it out if you're in the area, just for the fun of seeing what excuse they come up with not to let you in because you aren't a Pod Person). But certainly what we have here is the real deal - a band who are bloody awful, but nobody cares because everybody's having a good time. This takes me back to that long-ago gig by the Bash Street Kids in the Mason's Arms in Dufftown, the highlight of which was an overweight man dressed as a 1950s primary school pupil miming all the parts on both sides of a 1920s Chicago gang battle with a tommy-gun made from industrial scrap, accompanied by stock sound effects and several other adult men dressed as anachronistic children frantically bashing out "They're Burning Big Louie Tonight". The last thing I can remember about that night is the barman telling me: "I like an adventurous drinker - I'll get the pickled onions." Good times! PS I miss the stuffed animals background wallpaper! I'd just like to add that clearly this is the right kind of obscure album to be promoting, because the anonymous comment after mine says almost exactly what I too was trying to express. There are terrible bands who you laugh at ironically but don't truly enjoy. But these guys? Without being in any way sarcastic, I genuinely like them! Oh, I laughed of course, but with them, not at them. And there really is a difference. I don't believe for a second that they honestly thought they were good. But they obviously knew they were good enough to do their job, which was to bring pleasure to the people they catered for. And clearly they were correct - if I was old enough, I would have hired these guys to play at my wedding, because they manifestly knew how to make the event a blast for everyone including themselves. And it would have been money well spent, because they can't possibly have cost more than any run-of-the-mill band you'd just call "mediocre", yet how much more fun they would have been! I would like to state with my hand on my heart that this is "bad" music which cannot truly be bad because it's genuinely enjoyable to listen to, even if you've gotten beyond that awful "sneering ironically at crap" studenty attitude. Which I sincerely hope everybody in the world either has done, or will do real soon. Sometimes this site features "worst" records which genuinely are abysmal. I listen to then once, agree with the description, and probably don't bother to retain them on my external memory because, big though it is, why waste space? But this? Yeah, it's bad. It's really, really bad by every conventional yardstick. And yet, having listened to it once, my immediate reaction was to listen to it again because I felt better for having heard it. Now that's genius! The Muses have a place for these guys on Mount Olympus. Maybe not right at the front, but they definitely have one. There's a way to appreciate any kind of outsider art, but it always helps if the artists themselves make it easy. This is a classic example of that - what kind of humorless monster would you have to be not to like them? And once you like them, what, exactly, can you possibly accuse them of getting wrong? Apart from every single note in "She Loves You", but that in itself takes some doing. I have never agreed with Frank Zappa's claim that that the Shaggs were better than the Beatles, because they're in no way comparable, and I personally consider Frank Zappa to be a despicable human being. But I will come out of my closet and declare before the entire interweb that the Note-Ables are Better Than The Beatles. And since Frank Zappa is dead and I'm not, that's official. Dang, Mr. Fab, "File does not exist on this server." And I was all ready to be Really Disappointed! That's strange. Maybe zippyshare covered it ears and cried out "Nooooo!" Well, too bad -it's back. Oh, and: Preach on, Count Otto! And you just know they were once playing the Hialeah Holiday Inn rolling tape and talking after the gig at Treasure Island, laughing and saying "Wait till Count Otto hears this!" Well, I checked this one out today and I found it hard to listen to all the way through. After the third Beatles cover it felt like I was being hit on the noggin by Maxwell's Rubber Hammer. Still an enjoyable listen mixed with other tunes and you have my gratitude for putting it on here. Thats ok Nathan, this kind of genius may take a while to sink in. Or you haven't had enough to drink yet. You are a rude and disgusting individual. Those who can: do - Those who can't: blog. I was led here from the Cosmic Dennis greenidge post,and to my delight,The Note-ables have that special,but indescribable Z-Factor one looks for in Good/Bad music. Oh rapture. May I suggest a similar record,(that i have now lost!!! ), is the fabulously titled, "This Is Our Soul" by The Flamingo Group from communist Czechoslovakia,1970.They were the communist party sanctioned offcial 'soul' group',on the state label Suprophon. Showing us westerners how they have a good time on the other side of the Iron Curtain. ("Hey we have soul music too!") I do have three mp3 files from this,if anyones interested. Well, the Flamingo Group (were they pink?) just leaped to the top of my must-have list. oh Rapture! I have found IT! TIN HUEY "Contents Dislodged During Shipment"